San Mateo County is poised to spend more than a hundred million dollars on an expansion of Highway 101 while passing over more effective, less expensive options to improve people’s commutes. 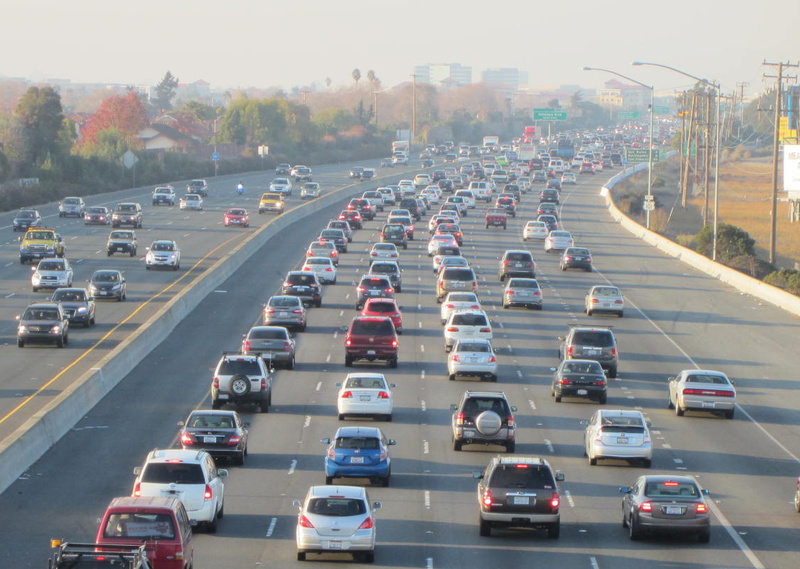 Even as total traffic volumes have remained flat over the past decade on Highway 101 in San Mateo County, the City/County Association of Governments (C/CAG) is conducting a $2 million study of expanding the highway with new carpool lanes. But highway expansions of already very large highways are simply not effective. In a new report, “Innovation Required: Moving More People with Less Traffic,” TransForm calls on C/CAG to consider an alternative that they say would be cheaper, more effective at reducing traffic congestion, and would improve public transit. Instead of adding carpool lanes, TransForm is pushing for conversion of one existing highway lane in each direction into “optimized high occupancy toll lanes” (Optimized HOT), also called express lanes. These lanes are free for carpoolers but also available to solo drivers for a fee, which is varied based on demand to ensure that they remain free-flowing. The report, which includes a traffic analysis of this option and two others, conducted by former C/CAG Transportation Programs and Planning Manager Joseph Kott, concludes that converting one existing lane in each direction to an express lane would move more people with less traffic at just one-tenth the cost of the agency’s current plans. Building the more expensive, less efficient options would waste a lot of revenue from the county’s half-cent transportation sales tax, Measure A, that could fund an expansion of transportation choices for residents and workers. With an estimated $130 – $160 million in construction cost savings, as well as new toll revenue, converted express lanes could provide a windfall of funds to improve non-driving commute options in San Mateo County, such as Caltrain, SamTrans, and the county’s disjointed bicycle and pedestrian network. Compared to C/CAG’s proposed carpool lanes, converting existing 101 lanes into express lanes would carry 75 percent more people in 10 percent fewer vehicles, while costing less than one-tenth as much to build, according to TransForm. Although it seems un-intuitive that a Highway 101 with an additional standard travel lane would end up more congested than converting an existing lane to a carpool lane, it works because the variable fee charged to solo drivers ensures that as many solo drivers are always in the carpool lane as possible without congesting it. Because the new express lanes, or “variable-fee-for-solo-drivers-carpool-lanes”, would also provide a congestion-free lane for buses and carpoolers, the number of people using buses and carpooling would increase because they would be faster driving alone. This results in fewer total vehicles and thus less traffic congestion. The 75 percent more people in 10 percent fewer vehicles figures are based on the same assumptions used by C/CAG for other traffic analyses but include factors ignored in C/CAG’s June 2012 carpool lane feasibility study, such as demand variable with pricing and mode shift from solo driving to transit. Kott, the former C/CAG planner, said transportation agencies also usually neglect to account for factors such as growing demand for public and private transit, walking, bicycling, and the potential for Transportation Demand Management (TDM) programs to provide financial incentives for non-driving commutes, since these are all relatively recent trends. The Bay Area’s first express lanes were added to Highways 680 and 237 in 2010 and 2012, respectively, and the Metropolitan Transportation Commission plans to build a total of 550 miles of them in the East and South Bay. But like C/CAG’s proposed Highway 101 carpool lanes, much of this network would be created by constructing new highway lanes, costing taxpayers several billion dollars and inducing more highway traffic. Transportation agencies say they won’t study express lane conversions because they’re banned by state law. Caltrans has also avoided carpool lane conversions since 1976, when poorly-implemented carpool lanes on Highway 10 in Santa Monica were used less than expected, worsening traffic congestion in the non-carpool lanes, leading to a public outcry and their subsequent removal. Toll lane conversions were then banned by the California Transportation Financing Authority Act of 2009, thus blocking Caltrans from approving them, even if the agency were to change its longstanding policy. But TransForm says that San Mateo County still has much to gain by studying the option, because it would be able to more accurately quantify the traffic reduction benefits of the express lanes and the cost savings they would provide. This is the first step to convincing the California Legislature to repeal the statewide ban on converting standard travel lanes to carpool lanes to address worsening traffic congestion, physical health, air quality, and climate change with a solution that actually works. I checked out AB 798/Nava, 2009 (Thanks for providing link). Why not convert a general purpose lane into a carpool lane as a back-up plan? Good article Andrew and timely study by Kott. Good to see: “Building the more expensive, less productive options would waste a lot of revenue from the county’s half-cent transportation sales tax, Measure A, that could be put to much better use.” Are there preliminary numbers you can put on “as well as new toll revenue, converted HOT lanes could provide a windfall of funds to improve non-driving commute options in San Mateo County, such as Caltrain, SamTrans, and the county’s disjointed bicycle and pedestrian network.” i.e. estimates of what could be available and where it could go?